Well this was a “vacation splurge” but I think if you are going to do donuts you should do them right . Fractured prune makes hot dipped donuts. 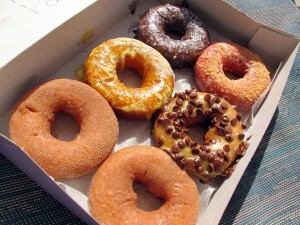 You can choose the glaze and topping(s) to add onto each hot cake donut. They are smaller than say dunkin donuts, but since they are a cake donut they are somewhat filling. Fractured Prune has a lot of shops in Maryland (several are down at the beach in Ocean city), Delaware, Ohio and Pennsylvania also have locations. These aren’t healthy.. but they are delicious. For instance: strawberry shortcake is a strawberry glaze with graham cracker crumbles. Also shown here are the OC sand (glazed with cinnamon and sugar), Lemon glazed with powdered sugar, Blueberry with powdered sugar, banana glaze with chocolate chip, and “French Toast” (maple glaze with cinnamon and sugar).